Below are Cantwell, Vargas, Shewmake, Boneau (blue overlapped) vs. Hutchison, Ericksen, Buys, VanWerven (red overlapped) for GE 2018 as of 11/08/2016 results. 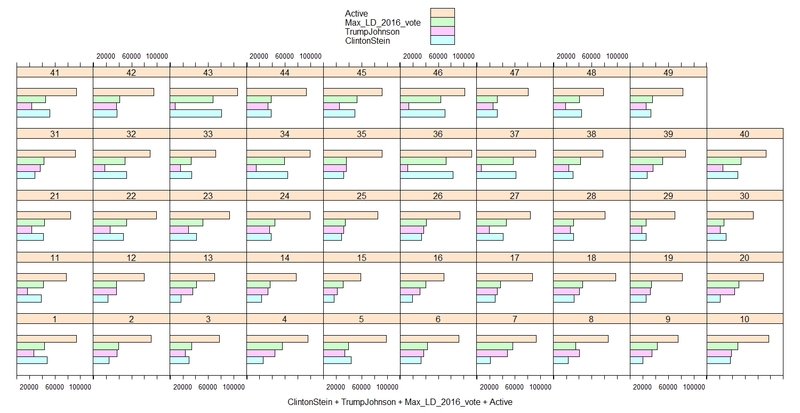 Bottom chart has Clinton+Stein vs. Trump+Johnson overlays. Click to enlarge. 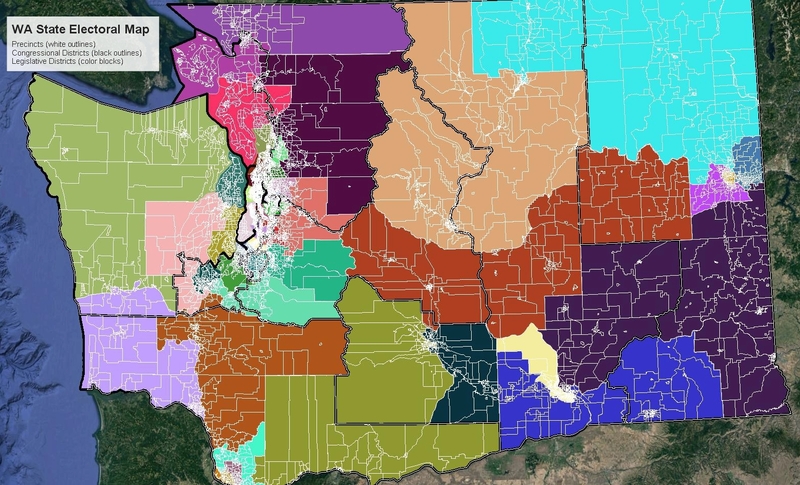 I make no attempt to deal with changed precincts or districts between 2016 and 2018 although there have been no County, CD , LD district changes in WA since 2010 of which I am aware. There have been plenty of precinct changes in many WA counties. So in many ways, if my projection of the GE2016 contest upon current races has any value, it is update us on who has voted more at this hour. More projections below the break. The Ballot Statistics page is always one morning ahead of the state wide matchback data. Statewide 2,305,405 good ballots have been returned as of 11.06.2018. The Ballot Status data is responsible for my projections. I have that data currently showing 2,234,777. WA Counties Turnout for 11/05/2018: 4:00PM Click to enlarge the chart. I will update this post with fresh data daily through the remaining election period. - RMF 11/05/2018 7:00 PM. Ballot Statistics as of 11.05.2018 4:00PM show 1.9M ballots returned. This is a fairly blistering state-wide 44.9% turnout rate. However, there is a wide range to county turnout currently stretching from 36.6% to 66.30%. Among counties with voter populations over 50K, Clallam, Whatcom, Island and Spokane county stand out for their turnout. If you have not yet received a ballot, you should call your local Elections office immediately. You should also vote early, check myvote.wa.gov and check "Ballot Status" box after voting. The magic phrase you want to see is "Your ballot has been accepted for tabulation." That means you are good to go! The Ballot Statistics page is always one morning ahead of the state wide matchback data. Currently, (11.05.2018), we are 0 days from the election. Statewide 1,937,253 good ballots have been returned as of 11.05.2018 4:00 PM. The Ballot Status data is responsible for my projections. I have that data from 11.05.2018 data currently showing about 1,881,846. This post gives GE 2018 ballot statistics and election projections for the "four county area": (WM,SK,IS,SJ) and their CD, LD districts. I am using a GE 2016 Clinton+Stein projection of precincts as the base for my projections due to wide scale national expectations of an unexpectedly large midterm turnout. My method will probably result in a gross approximation of outcomes. I am using no private voter files, no latent classes, no individual profiling, just precinct percentages. The Ballot Statistics page is always one morning ahead of the state wide matchback data. Currently, (11.06.2018), we are 1 day from the election. Statewide 2,305,405 good ballots have been returned as of 11.06.2018. The Ballot Status data is responsible for my projections. I have that data currently showing about 2,234,777. In the table below, we can see combined GE 2016 results for Clinton+Stein (CS) or Trump+Johnson (TJ) and Primary 2018 results for MariaCantwell (MC) or SusanHutchison (SH). Skagit 10 (light blue), Whatcom 42-2 (dark blue) and 40th LD (yellow) are critical for Democrat success in the four county area. In reality, only WM 40-2, WM 42-2, SK 40-1 and SJ 40-2 are sure bets for 'blue' in a heavy turnout GE. This makes LD 40 + WM 42-2 (North Bellingham) the liberal anchors in a four county area that could turn red with a stronger Republican turnout. This helps put the "double Mike P." strategy in perspective. Petrish and Peetoom can't really beat Lekanoff and Frazey, but they can help Seguine (R) beat Hazelrigg-Hernandez (D) and also help the 42LD Rs in their customary cruise over the 42LD Ds. No votes can be taken for granted in this year's four county election that mostly pits middle-aged Republican men versus progressive Democratic women. The primary went mostly to the Democrats in Whatcom County. However, turnout is likely to resemble GE 2016 this November due to the new stampless ballot and an unruly, "hyper energized" electorate now chafing at their electoral bits nationwide! Let the balloting begin! In the charts below, black lines are Congressional Districts (CD1 & CD2). Red lines are Legislative Districts 10, 39, 40, & 42. Blue scale for precincts is the Clinton+Stein percentage. 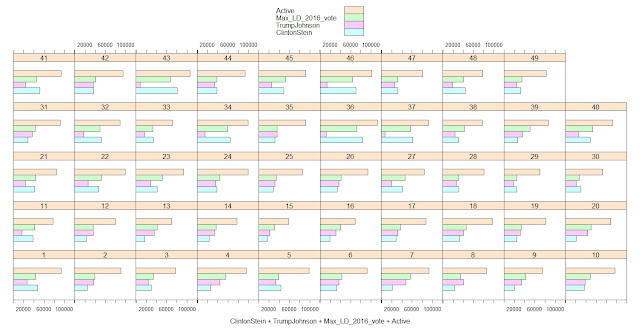 Note that Clinton+Stein vs. Trump+Johnson doesn't give us the complete picture for GE 2016 since there were so many (un-tabulated) write-ins presumably for Bernie. For more data, please see 'Notes' far below. Click to enlarge the charts! Ryan's Brief List of Sites to Help Prepare Your Mind for the Upcoming Election Season! IMPORTANT FOR WA VOTERS : "Deadline for in-person, mail-in & online registrations or address changes" for the August Primary is Monday July 9th!! Happy July 4th readers! Please read the post below the break for some light summer reading and preemptive electoral deprogramming! This includes my brief list of sites to prepare you as a voter for the thoroughly corrupt, fascist, manipulative, authoritarian, psyops and data driven world we all swim in now! And don't forget to register to vote and/or update your changed address at myvote.wa.gov before Monday July 9th! Doesn't hurt to check even if you haven't moved!